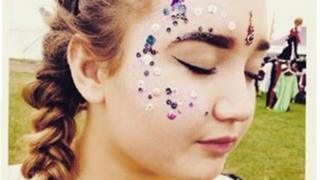 A girl who is thought to have died because of an adverse reaction to what used be called a legal high "paid the ultimate price", her family has said. Leah Kerry, 15, who attended school in Salisbury, died in hospital on 16 July having been found unconscious at an address in Newton Abbot, Devon. In a statement, her family described her as "a courageous and confident young woman." She knew the dangers of drugs, but "thought she was invincible", it said. "Sadly, despite being well aware of the risks, she thought she was invincible and she rolled the dice and has paid the ultimate price", the statement said. Image caption Leah Kerry's family said she "rolled the dice and paid the ultimate price"
A statement given to Devon and Cornwall Police on behalf of the family said: "Leah lit up any room she walked into with her incredible personality, sense of humour, striking looks and demeanour. "Those who know her will ache to hear the words 'You allriiight' one last time." The family warned other people against taking "dangerous NPS (new psychoactive substances) tablets" and urged "the government to place the dangers of psychoactive substances at the top of their agenda for discussion on the back of their Drugs Strategy for 2017." Jacob Khanlarian, 20, from Newton Abbot, who was charged with intent to supply drugs in connection with the incident, will appear before Exeter Crown Court on 10 August.